We’d just finished Sunday brunch in Hong Kong’s oh-so-sassy SoHo when I announced (with just a hint of mischief) that it was time for us to get a family pet! “What and where from?” stammered my slightly alarmed husband. 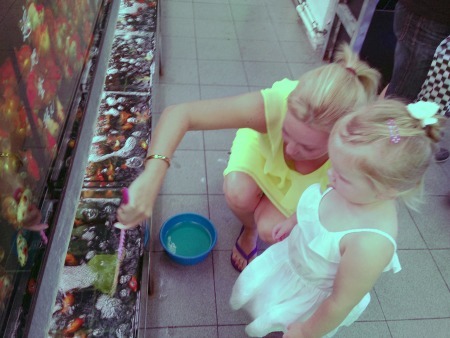 Surely you’ve heard of the famous Goldfish Markets I pressed? He hadn’t. But I had….and I’d decided after three years, it was time to go and get ourselves amongst them – even if it was just to look at the spectacle I’d heard so much about. 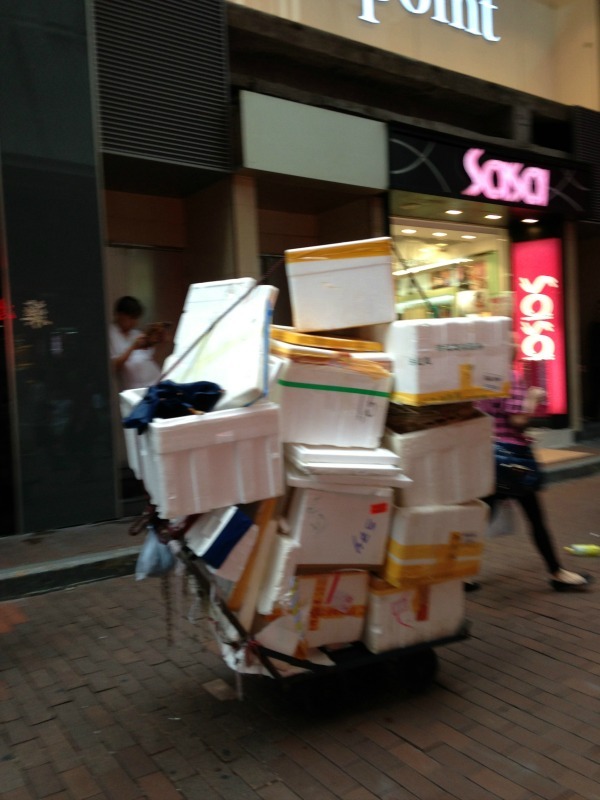 When it comes to shopping in Hong Kong, I’ve discovered there’s pretty much a street for everything and anything. An entire street dedicated to your retail requirements! Bonus is, you don’t have to stray too far from our neck of the woods for a lot of these ‘specialty’ streets. 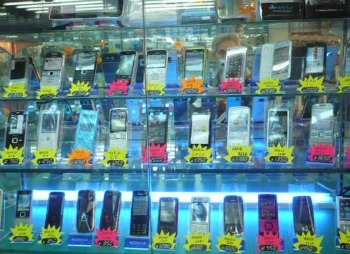 Mighty Mong Kok is your ‘one stop shop’ if you want something remotely weird and wonderful, like say a specific electronic gadget at a bargain basement price, a caged bird or maybe a bunch of Hong Kong’s freshest flowers or yep even a kitchen sink! 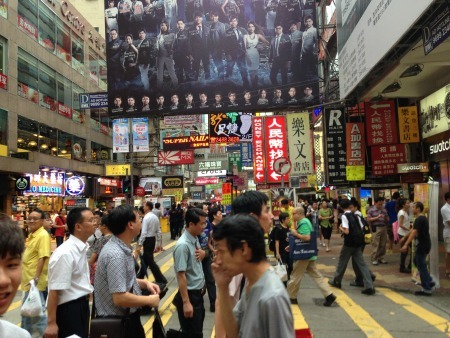 It goes without saying that Mong Kok is rarely, if ever, quiet…. unless it’s morning, then things are a little on the sleepy side. Come afternoon it’s literally heaving and on a weekend, well…you need to suit up ready to do battle with the teeming mass of humanity! 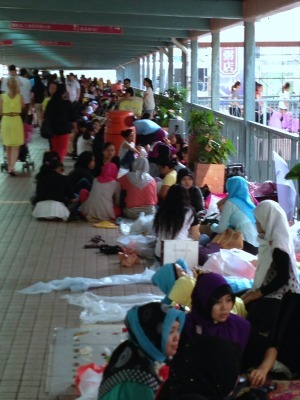 Above ground, footbridges connecting tall buildings are overflowing with bodies – and it’s not just Hong Kong’s Sunday shoppers hastily making their way to and from their shopping destination – Filipino Maids clambering for a patch of land to relax on, on their one day off, take up residence on these walkways that are well and truly swarming with people. Sitting on cardboard boxes, they socialize, eat, drink and be merry. Some even sleep. Walking through their ‘Sunday session’ is a little like walking the gang plank…hundreds of pairs of eyes take a peek at the trio of unmistakeable Guailos, as we scurry past. 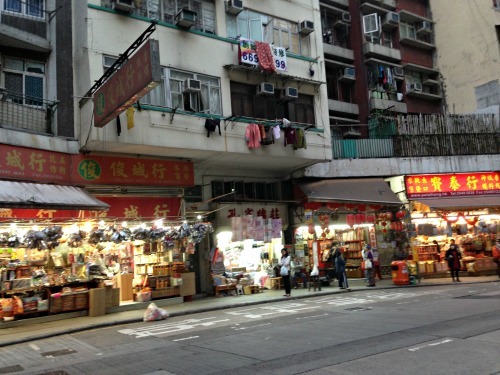 On the ground, streets flanked by uneven footpaths are jammed with people ducking and diving in every direction; old buildings – some laced with wall-to-wall bamboo scaffolding – others laden with hanging washing – loom over a jigsaw of neon signs parading every variety of ‘retail therapy’ imaginable. As you muscle your way through the crowds, not only do you need to look in front of you, you need eyes on the ground, up above and quite possibly in the back of your head! Drops of water splash on your head from the myriad of air conditioners whirring above in overdrive to combat the steaming humidity. A plethora of cobbled-together stalls and shops exhibit a mish-mash of goods mostly selling variations of the same thing. This is the alternative to shopping in Hong Kong’s giant shopping malls where designer stores rule the retail universe. So arriving in one piece (just) on Goldfish Street we found a whole street dedicated exclusively to pets – mostly of the small fish variety. 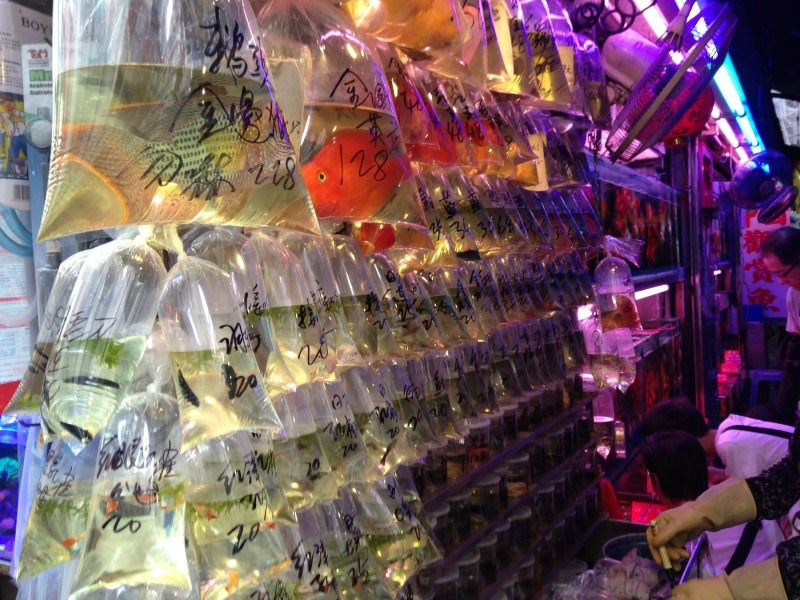 Plastic bags containing brightly-colored fish hung like lolly bags in shop entry-ways beckoning passersby, while inside tanks lined the walls, filled with fish in every color and size. We spot bird cages for sale but no birds. That’s OK, Bird Street or Yuen Po Street is just down the road. Here you’ll find hundreds of birds twittering in exquisitely crafted bamboo cages. This is where you can see an ancient Chinese hobby in action. Elderly men have fed and preened their feathered friends for thousands of years, all in return for a chorus of sweet songs. 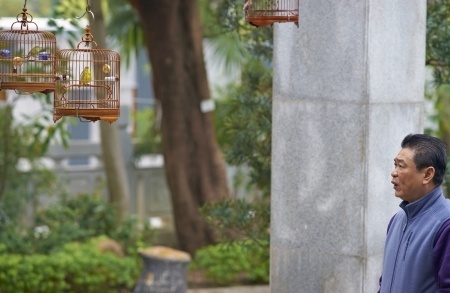 In fact, it’s not uncommon to see owners walking their birds in local parks! A stone’s throw away, the famous Ladies Markets stand with an avalanche of neatly stocked stalls brandishing copy handbags, iPhone cases and Chinese trinkets in every shade conceivable. Nearby is Fa Yuen Street or what’s been dubbed Sneaker Street – where for the past few decades people have flocked for a taste of what’s quite possibly the biggest gathering of sports shoes on the planet. Nike, Adidas, Puma, you name it, this street owns it. Then there’s Cat Street – overflowing with rare Chinese treasures (not those of the meowing type) antique dealers offer everything from Ming dynasty furniture to ancient snuff bottles, antique coins and kitschy bargains. Jade Street is of course as it sounds. 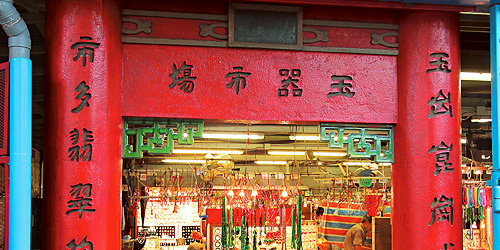 A market with a hefty supply of jade jewellery on display. Given jade symbolises ‘long life and good health’ in Chinese, the markets here are unparalleled by any other on the globe. If you need a lucky charm…you’re in the right place. Up for some DIY action, Tile Street is dedicated to – funnily enough – tiles, wall paper, window frames, bath tubs and maybe even the odd kitchen sink! A little further afield, there’s a Photocopy Street (apparently there are a lot of schools nearby)! Fancy some black moss, dried snakeskin, dried sausage, scallop or abalone? 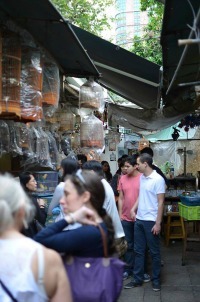 Dried Seafood Street in Sheung Wan is calling you! Birds Nest Street is not too far from here either. No prizes for guessing what’s on the menu….just in case you’re wondering, this is the ‘eating’ kind of birds nest. 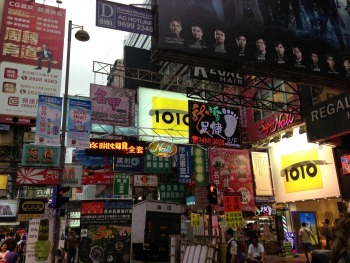 Sheung Wan is also home to the Business Card Market, a single lane way crowded with business card vendors who’ll develop and design your personal business card in 24 hours. Handy! 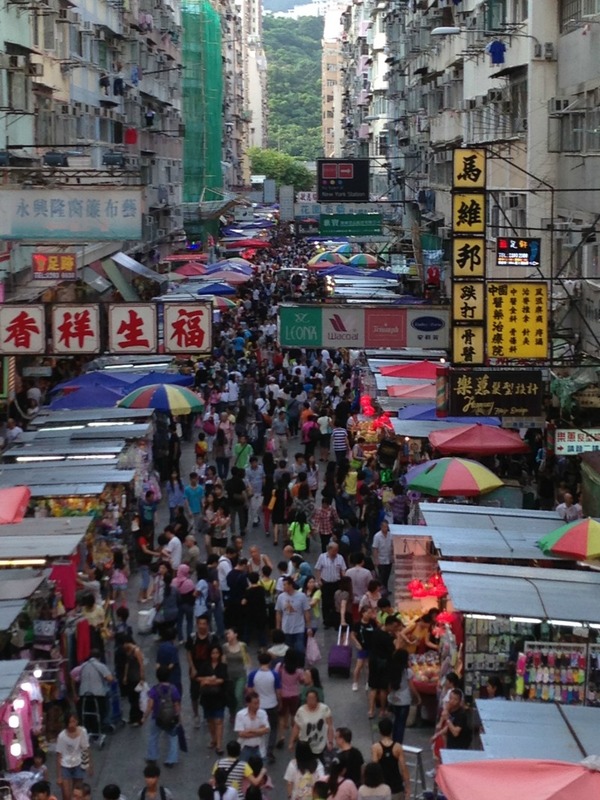 So about now you probably get the gist…forget about those big glossy designer shopping malls in Hong Kong, get up close and personal at street level where shopping in Hong Kong is a whole different kettle of fish. Sadly, with my visit to Goldfish Street, I think the last laugh’s on me. With my toddler’s half-hearted interest in Gilly and Goldy, her fish – my husband and I seem to have spent more time huddled over the fish tank, tending to their every whim. Who knew pet fish could be so much work?! Just for fun, I asked my husband if he’d heard of Cat Street……. Some of the hotels in Hong Kong provide you with goldfish when you book a single room. In case you feel lonely. Sweet!